PNNL: Microbes Take Center Stage in Workings of "the River's Liver"
This appeared April 7 as a PNNL news release that includes video and more photos. Scientists call the area along a river where river water and groundwater mix the hyporheic zone. The circular inset illustrates some of the features of this zone, including tiny grains of sediment, water from both sources mixing, and the microbes that actively ply these waters and sediments. Enlarge image. Results: When water levels in rivers rise, an area known as the "river's liver" kicks into action, cleansing river water of pollutants and altering the flow of greenhouse gases into the atmosphere. Now, in a paper published April 7 in Nature Communications, scientists at Pacific Northwest National Laboratory present evidence suggesting that rising river waters deliver a feast of carbon to hungry microbes where water meets land, triggering increased activity, which could naturally boost emissions of carbon dioxide, methane and other greenhouse gases. Why It Matters: Worldwide, bacteria, fungi, algae and other microorganisms in and around rivers convert massive amounts of organic carbon into carbon dioxide, methane and nitrous oxide—processes that are central to the future of the planet. 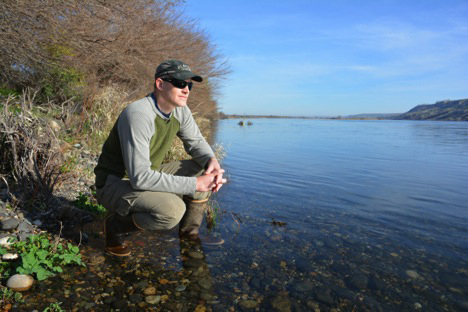 PNNL researcher James Stegen in his “laboratory”, the shoreline of the Columbia River. He and his colleagues study a riverine biogeochemical hotspot, where hungry microbes may boost emissions of carbon dioxide, methane, and other greenhouse gases. Enlarge image. Stegen's team focused on levels of microbial activity in an area known as the hyporheic zone, which includes the sediment where river water mixes with groundwater. Most people might know the area best as a place where they're likely to sink into squishy mud and get soaked feet. It includes the land directly beneath the river as well as along its edges, sometimes extending up to a few hundred yards from the river's edge. The sediments under the land surface are often porous like a sponge, becoming saturated when river water is high—such as during floods, high tides, and large releases of water from dams—and draining when water is low. 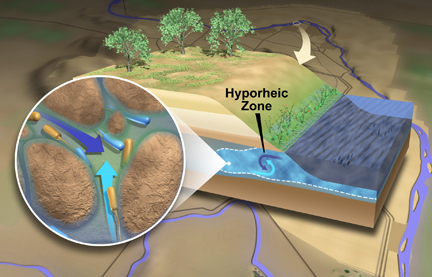 Scientists know the hyporheic zone as a critical ecological feature that harbors a rich diversity of microorganisms that filter a river's water. For instance, the hyporheic zone removes nitrates—pollutants that come from agricultural runoff and sewage releases. But the zone has not been a focus for many scientists; they typically have their hands full analyzing the complex conditions in either groundwater or river water. Focusing on the area where the two types of water mix is incredibly challenging, but critical for understanding the planet's response to environmental change. The rising waters spell opportunity for hungry microbes that may have been without food since the last high water event. The water cascades through channels and pores in sediment and rock, moving grains of sediment; slowly eating away at rock; and delivering meals of carbon, oxygen, nitrogen and other substances. The team found that when river water and groundwater mix, there is a decline in the dissolved organic carbon and an increase in inorganic carbon—clear signals that microbes have been stimulated to consume organic carbon and produce carbon dioxide. The exact reason for the increased microbial activity has been a source of debate for scientists. Some have thought that the sudden change in water flow causes the microbes to change their chemistry or to simply blow apart. But Stegen's team believes the increased activity is largely the result of the physical changes that come with rising waters—how water filters through sediments, carrying carbon to the nooks and crannies of the hyporheic zone—and how long-isolated microbes respond to the sudden influx of food. The team hypothesizes that the main source of carbon fueling these spikes in activity is from carbon and nutrient sources in the river, in the form of small bits of leaves, plants, dead fish, and other detritus. The scientists also showed that as this microbial action increases, the overall ecological activity of the system becomes more directed and predictable—a finding that seems paradoxical given the dynamics of the mixing waters and the intensified microbial activity. Methods: The team's data included sophisticated measurements of various forms of carbon from water samples taken from the Columbia River and its hyporheic zone both along the shoreline and from groundwater wells approximately 100 yards away. The team conducted its study in November 2013 in central Washington, where the Columbia—one of the nation's largest rivers—flows near the Hanford Site, a former nuclear materials processing facility. River levels fluctuated by about three feet during this time, caused mainly by adjustments in water discharge at dams upstream. Since then, some rivers in the Pacific Northwest have seen more extreme fluctuations, particularly the Yakima, which relies on snowmelt from the Cascades to the west. As global temperatures continue to warm, scientists expect extreme climate events to occur more often, including longer periods of drought and larger storms. Stegen's team is exploring the implications for river dynamics. For instance, less snowmelt could translate to big changes in the timing and magnitude of river water and groundwater flow—making the need to understand what happens in the hyporheic zone even more important. Sponsors: The study was funded by the U.S. Department of Energy (DOE), Office of Biological and Environmental Research (BER), as part of the Subsurface Biogeochemistry Research Program's Scientific Focus Area (SFA) at PNNL. Parts of the research were performed using computing and instrumentation at the Environmental Molecular Sciences Laboratory (EMSL), a DOE Office of Science User Facility at PNNL. Scientists from Ohio State University contributed to the study. Research Team: James C. Stegen, James K. Fredrickson, Allan E. Konopka, William C. Nelson, Evan V. Arntzen, William B. Chrisler, Rosalie K. Chu, Sarah J. Fansler, David W. Kennedy, Charles T. Resch and Malak Tfaily, PNNL; Robert E. Danczak and Michael J. Wilkins, The Ohio State University. Reference: Stegen JC, JK Fredrickson, MJ Wilkins, AE Konopka, WC Nelson, EV Arntzen, WB Chrisler, RK Chu, RE Danczak, SJ Fansler, DW Kennedy, CT Resch and M Tfaily. 2015. "Groundwater-surface Water Mixing Shifts Ecological Assembly Processes and Stimulates Organic Carbon Turnover." Nature Communications 7:11237. DOI: 10.1038/ncomms11237. In one sentence: Researchers at Pacific Northwest National Laboratory study busy and hungry river's-edge microbes that may boost localized emissions of greenhouse gases. In less than 75 characters: Researchers find how microbes at river's edge influence climate change.